Reliance Info comm went to the public in 2005 and was rechristened as Reliance Communications (RCom). But, the younger Ambani's business seems to be struggling as compared to his elder brother Mukesh. 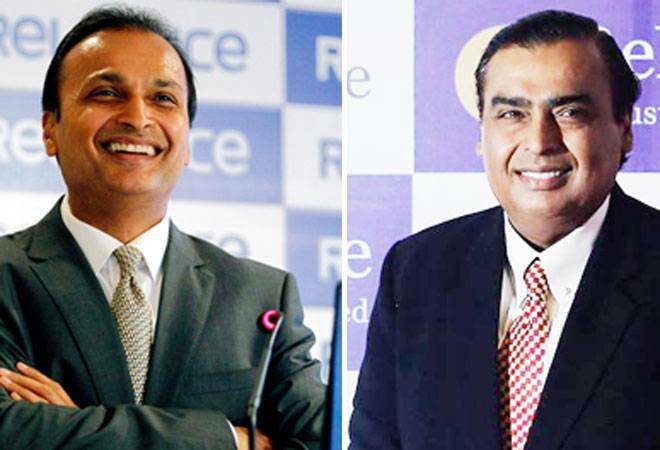 After the launch of Reliance Jio, brother Mukesh Ambani and Anil Ambani, who split ways following the death of Dhirubhai Ambani in 2002, find themselves in the same sector, but their fortune seems to be heading in opposite directions. The launch of Jio has affected all incumbent telecom players. While Airtel, Vodafone and Idea are still fighting it out with Jio, Anil Ambani's Reliance Communications seems to be spiraling downwards. After the division in 2005, elder brother Mukesh got the flagship oil business, RIL and IPCL, while Anil got the control of Reliance Infocomm (telecom), Reliance Energy (power), Reliance Capital and Reliance Natural Resources (RNRL). Reliance Info comm went to the public in 2005 and was rechristened as Reliance Communications (RCom). But, the younger Ambani's business seems to be struggling as compared to his elder brother Mukesh. Here's what the numbers say for both the Ambani brothers. Anil Ambani-led Reliance Group: Anil Ambani-run Reliance Group's revenues increased by 270 per cent to Rs 59,685 crore (a comparison of the combined consolidated revenues of the companies in 2004-05 or since each one's listing, with the last financial year numbers) - thanks to the listing of Reliance Communications, creation of Reliance Power and acquisition of Pipavav Defence. The total of the consolidated profits of five companies comes to Rs 4,226 crore in the last financial year. Reliance Jio: Mukesh Ambani-led Reliance Industries Limited spent Rs 1,50,000 crore on its newly-launched Jio 4G services including spectrum. However, according to a report in the Bloomberg in January this year, Jio's overall debt stood at Rs 49,000 crore added to the spectrum liability. RIL is aiming to become debt-free in the next three years with new cash flows from petrochemicals and 4G services. Earlier in February, Bussiness Today magazine reported that RIL's outstanding debt at the end of the third quarter of the last financial year stood at Rs 194,381 crore while cash and bank balance - bank deposits, mutual funds, corporate deposits, government bonds and other marketable securities - was Rs 76,339 crore. Reliance Industries' last three years' investment is equal to what the company has invested in its entire 35-year history. Reliance Communication: As on March 2017, Anil Ambani-led Reliance Communication's gross debt stood at Rs 45,733.4 crore. Maybe that is what prompted rating agency Moody's to downgrade RCom rating . The rating of RCom has been reduced to Caa1 (reflects poor quality and very high credit risk) from B2 (speculative and high credit risk) on account of weak performance and "fragile" liquidity position. However, the Reliance Group tried to allay the fear and said that it has told lenders that it would repay Rs 25,000 crore before September 30 this year post completion of its three different deals. RCom has started declining in terms of profit and customers in the last couple of quarters. It could also be another reason behind Moody's degradation. The telecom player reported loss of Rs 948 crore for the fourth quarter ended on March 2017. It had registered net profit of Rs 79 crore in the corresponding period of the previous year. It couldn't sustain the intense price pressure unleashed by Reliance Jio. Reliance Jio: Reliance Jio had issued a press statement on 21 February and said: "With 100 crore GB of data traffic per month and 200 crore voice and video minutes a day, Jio has become the largest network globally in terms of data carried and contributed to India becoming the leading country in the world for mobile data usage! Jio users are today consuming nearly as much data as the USA and 50% more data than China in a clear indication that India can and will adopt digitisation and Digital Life faster than anyone else in the world." Reliance Communication: Reliance Communications has registered decline in total data customers, total data traffic and data usage per customer. For instance, its total data customers fell from 38.9 million a year ago to 28.3 million in the last quarter. The total data traffic on its network dropped to 79,554 million megabits in the last quarter to 104,743 million megabits a year ago. Reliance Jio: Outlining the achievement of Jio's 4G network, Reliance Jio in a press statement said: "Jio's network is literally present in every city, town and village of the country with more than double the number of 4G base stations when compared to those of all the other Indian operators put together. By the end of 2017, the Jio network will be present in nearly all the cities, towns and villages of India covering 99 per cent of our country's population." Reliance Communication: Reliance Jio's entry into telecom market created massive tariff wars forcing other incumbent players to cut their data and voice pricing. Telecom majors Airtel, Vodafone and Idea had to bring down their current prices resulting massive loss in average revenue per users. While every incumbent players bore the brunt of Reliance Jio, it turned out Anil Ambani-run Reliance Group was the worst loser in this intense competition. Rcom failed to retain their voice customers as customers kept switching from its network to other telecom companies. Reliance Jio: Reliance Industries Chairman Mukesh Ambani on February 21 said that Jio telecom unit crossed 100 million subscribers in just 170 days. Relaince Jio issued a press statement saying, ''Reliance announced today that the Jio family of subscribers is a 100 million strong! Jio's offering saw record additions of 7 new members per second, every single day for the last 170 days, enabling it to cross the 100 million mark within six months of commencement of services." It further said that this was the fastest achieved by any start-up technology company in the world including the likes of Facebook, WhatsApp and Skype. Reliance Communication: While Reliance Jio succeeded in bringing more than 100 million customers in less than six months, Reliance Communication's core business telecom services is witnessing steady decline over the past few quarters. According to a Business Today report, RCom voice subscribers shrunk to 84.7 million in fourth quarter of 2016-17 from 103.6 million in the same quarter last year. And not only that, the company has also lost its voice average revenues per user which fell from Rs 107 a year ago to Rs 87 now.